These miniature frequency synthesizers employ dynamic optimization to reach the best combination of fast switching speed and low phase noise over wide bandwidths. Frequency synthesizers come in many forms, depending upon the needs of an application.For the price of banks of filters and large bulk, direct analog frequency synthesizers offer unmatched frequency switching speed, although usually with trade-offs in spurious and phase noise. By sacrificing switching speed, few sources can match the low-noise performance of a phase-locked-loop (PLL) synthesizer with narrow loop filters and a high-quality crystal reference oscillator.1-7 Bridging the gap between low phase noise and fast switching speed has been a goal of many synthesizer designers and a driving force behind the development of the new fast-settling frequency synthesizers (FSFS) series of miniature synthesizers from Synergy Microwave (Paterson, NJ). 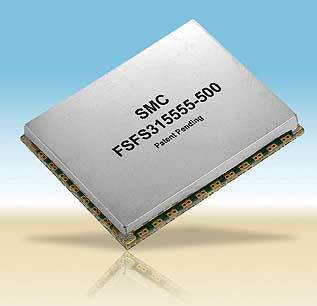 Among the first models is the FSFS315555-500 with wide tuning range of 3150 to 5550 MHz and switching speed of a mere 50 µs, all in a surface-mount-technology (SMT) package measuring only 1.25 X 1.00 in. and low phase noise measuring just 1.0 x 1.25 in. The FSFS315555-500 (Fig. 1) is barely larger than the voltage-controlled oscillator (VCO) upon which it is based. It delivers at least +5 dBm output power over its broad 2400-MHz tuning bandwidth, with a nominal output impedance of 50 W. The synthesizer achieves its fast tuning speed in 5-MHz steps. The switching speed (see table) of 50 Ωs is measured as the time required to settle to within 10 kHz of a new frequency. Measurements taken of the FSFS315555-500's switching speed (Fig. 2) show the specification to be conservative, and included the programming time of the PLL. jump back from 5.5.to 3.2 GHz (Bottom). tuning range (Fig. 3). Spurious content is no greater than –60 dBc and typically –75 dBc. Harmonic levels are –10 dBc or less. The miniature synthesizer is designed to hold its performance levels over an operating temperature range of –20 to +85°C. were measured at 3205 MHz. These new FSFS synthesizers actually represent a design platform that can work with virtually any 0.5 X 0.5 in. VCO in the company's product lineup, including smaller oscillators in the DCYR and DCYS YIG-replacement product series (see Microwaves & RF, April 2006, p. 80). For example, model DCYS2004005 is one of the aforementioned YIGreplacement oscillators (so named for their small size, low power consumption, and YIG-like low phase noise) with an output frequency range of 2000 to 4000 MHz and +2 dBm minimum output power. Additional examples of VCOs that can be "transformed" into FSFS frequency synthesizers are the model DCMO1857 with +3 dBm minimum output power from 180 to 570 MHz, model DCMO60170-5 with +3 dBm minimum output power from 600 to 1700 MHz, and model DCMO190410-5 with +2 dBm minimum output power from 1900 to 4100 MHz. The company's engineering team currently has designed four different synthesizer circuit boards to accommodate the different mechanical and electrical requirements of the firm's smaller VCO lines in order to quickly meet customers' synthesizer needs. The new FSFS frequency synthesizers are based on the ADF4106 PLL frequency synthesizer integrated circuit (IC) from Analog Devices a single-integer N type device that accepts input frequencies to 6 GHz and maximum reference frequencies to 300 MHz, and exhibits nominal phase noise of –219 dBc/Hz. Because the AD4106 features a separate charge-pump supply with programmable current as well as a programmable dual-modulus prescaler with division ratios of 8/9, 16/17, 32/33, and 64/65, Synergy Microwave designers such as Juergen Schoepf, vice president of engineering, and his group were able to develop an optimization scheme by which the normally conflicting parameters of switching speed and phase noise could be dynamically traded off for the best combination of performance. Finding the optimum setting under all operating conditions is sometimes a tedious task for the application engineer. To shorten product-development time, all of Synergy's synthesizers can be equipped with build-in intelligence (IIS) in the form of a microcontroller. The microcontroller takes care of programming the PLL chip with the optimum settings across the frequency band and provides, independent of the PLL chip and frequency range, a standard programming interface to the user. All there is to program is the desired frequency in the form of a serial or parallel protocol. In addition, Schoepf adds, the phase noise can literally be tuned by taking advantage of the AD4106's flexible charge-pump current programmability. For example, Fig. 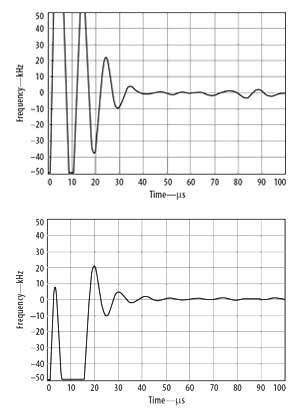 4 shows the phase noise of the FSFS315555-500 at different frequencies and with a charge-pump current setting of 5 mA. 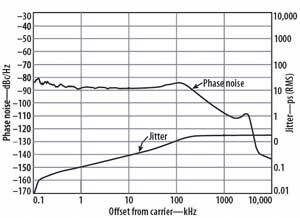 He offers "To compensate for the resulting loss in phase noise at 1 MHz offset from the carrier as the filter bandwidth is widened, the charge-pump current is adjusted accordingly to reduce the phase noise." To achieve fast frequency switching with one of the FSFS synthesizers, he recommends that the charge pump current always be programmed for the highest setting during the frequency jump. After the PLL has settled close to the desired frequency (which requires about 25 to 30 µs), the charge pump current can be reduced to meet the required phase-noise specification. The AD4106 PLL supports an automatic change in charge pump setting after a number of reference cycles to help facilitate this performance optimization. a function of the loop filter's transfer function (and not loop instability). The PLL IC within the FSFS frequency synthesizers employs a simple three-wire programming interface and the synthesizers themselves are relatively simple to program. Microsoft Windows-based personal-computer (PC) synthesizer controller software is included with each synthesizer for programming, and is also available for free download from the company's website. The easy-to-use software allows users to set operating parameters, such as start and stop frequencies. Low Noise Microwave Wideband Push-Push VCO, U.S. Patent No. 7,088,189, August 08, 2006. U.L. Rohde and J. Whitaker, Communications Receivers DSP, Software Radios, and Design, published by McGraw Hill, New York, NY, 2001. U.L. Rohde, A.K. Poddar, and Reimund Rebel, "Ultra Low Noise Low Cost Octave-Band Hybrid-Tuned VCO," 18th IEEE CCECE05, May 2005, Canada. U.L. Rohde, A.K. Poddar, Juergen Schoepf, Reimund Rebel, and Parimal Patel, "Low Noise Low Cost Wideband N-Push VCO," IEEE, IMS Symposium, MTT-S 2005, USA. U.L. Rohde, K.J. Schoepf and A.K. 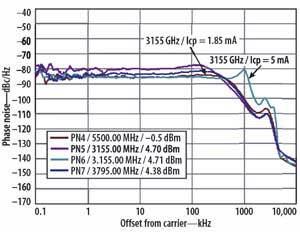 Poddar, "Low-Noise VCOs Conquer Wide Bands," Microwaves & RF, pp. 98-106, June 2004. Ulrich L. Rohde, Microwave and Wireless Synthesizers: Theory and Design, by John Wiley & Sons, August 1997, ISBN 0471-52019-5, p. 215. U.L. Rohde, A.K. Poddar and G. Boeck, Modern Microwave Oscillators for Wireless Applications, John Wiley & Sons, Inc., 2005.